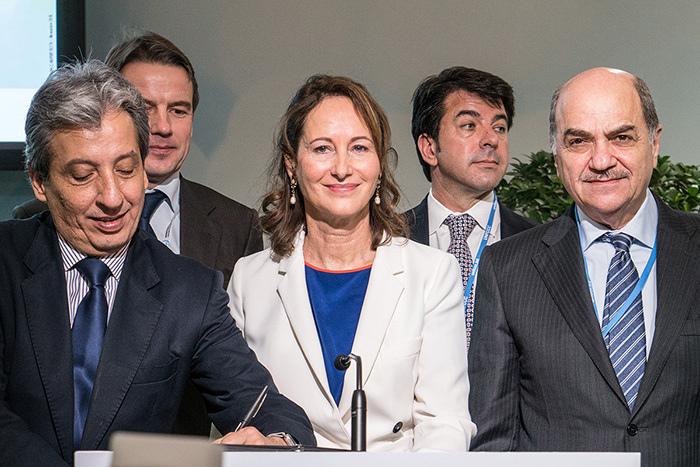 The signing ceremony at the Lima-Paris Action Agenda (LPAA) Focus on Resilience side event. Deploying Resources of the Green Climate Fund (GCF): "What Makes a Good Project"
This session was hosted by Kunihiko Shimada, Chair, Technology Executive Committee (TEC) and Matthew Kennedy, Chair, Climate Technology Centre and Network (CTCN) Advisory Board. 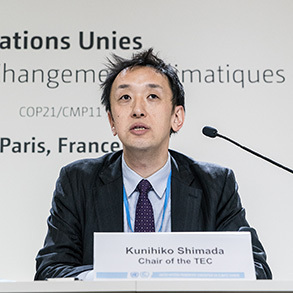 Shimada explained that the TEC analyzes and advises on policy issues related to climate technology development. 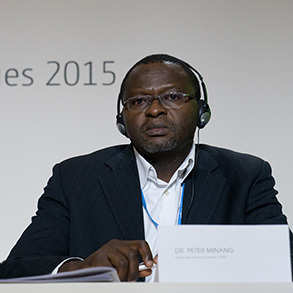 He presented key TEC achievements in 2015, including briefs on: facilitating technology deployment in distributed renewable electricity generation; strengthening national systems of innovation to enhance action on climate change; and enhancing access to climate technology financing. He also highlighted TEC work on good practices of technology needs assessments and its evaluation of the GEF’s Poznan strategic programme on technology transfer. Finally, he presented potential areas for further work, including: technology needs assessments; national systems of innovation; finance for research, development and demonstration (RD&D) of climate technologies; South-South cooperation for adaptation technologies; and distributed renewable energy. 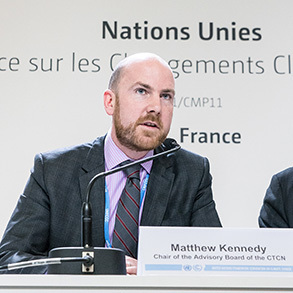 Kennedy explained that the CTCN provides: technical assistance - at the request of developing countries - to accelerate the transfer of climate technologies; access to information and knowledge on climate technologies; and a platform for collaboration among climate technology stakeholders. He emphasized the need to respond to Parties’ requests, and to facilitate collaboration and enable the engagement of stakeholders, adding that the CTCN network now comprises more than 100 organizations. Jukka Uosukainen, Director of the CTCN, presented on the role of the CTCN as the operative arm of the Technology Mechanism. He informed that the CTCN network comprises partners across the world and that any institution and organization can apply. He explained that the work of the CTCN is country-driven, covers the whole spectrum of technology transfer, and is technology-neutral. He highlighted that the number of requests to the CTCN has risen and that requests on adaptation are particularly welcome, as so far they have been less numerous than those on mitigation. He flagged that the CTCN budget still has a gap that needs to be supplemented, either by bilateral or multilateral sources. Participants discussed, inter alia: the possibility of multiple country requests to the CTCN; the number of requests received and already answered by the CTCN; reactive versus proactive strategies for the work of the CTCN; expertise in the CTCN network; and CTCN staffing and financial resources. Matthew Kennedy, Chair, CTCN Advisory Board, presented on the achievements of the CTCN. Kunihiko Shimada, Chair, TEC, presented on the achievements of the TEC. Jukka Uosukainen, Director, CTCN, explained how the CTCN works. Panel (L-R): Asher Lessels, UNFCCC Secretariat; Jukka Uosukainen, Director, CTCN; Matthew Kennedy, Chair, CTCN Advisory Board; and Kunihiko Shimada, Chair, TEC. 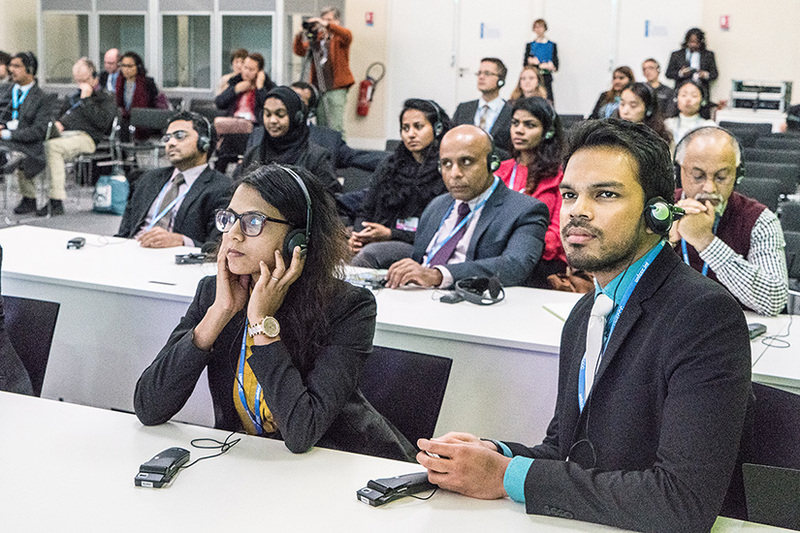 Fred Boltz, Managing Director, Rockefeller Foundation, welcomed participants to the LPAA special focus event on water resilience, outlining climate change as an accelerator of shocks and stresses. Manuel Pulgar-Vidal, Minister of Environment, Peru, stated that resilience must be a main objective in discussions on climate change, given its importance for adaptation and vulnerability reduction. He underscored the need to give greater attention to water, noting its importance for issues such as food security. 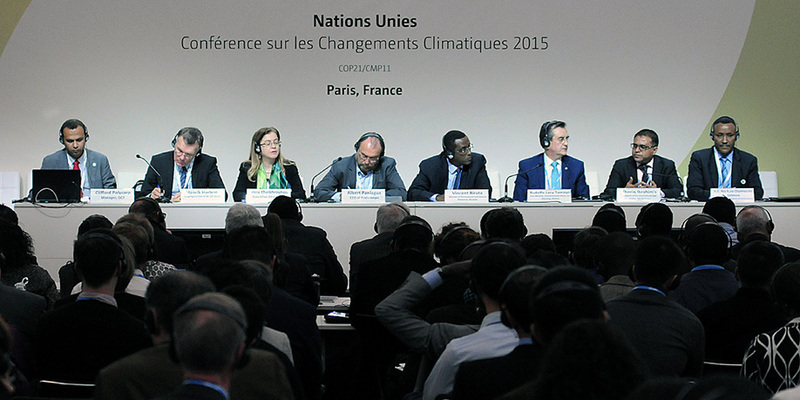 Ségolène Royal, Minister of Ecology, Sustainable Development and Energy, France, stated resilience as the key topic “at the very heart” of COP 21. She described water and climate change as inseparable, and observed water’s central importance to human lives and peace. Stating that 4000 children die each year due to hydric stress, she pronounced it a matter of climate justice to safeguard water resources into the future. 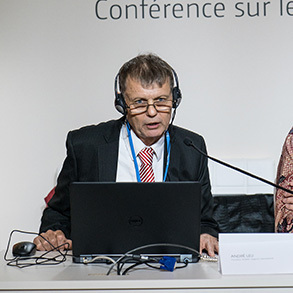 Moderator Jean-François Donzier, International Network of Basin Organizations, opened a panel discussion on the Paris Pact, asking participants to explain the main problems in their countries and possible actions to overcome them. Du Guozhi, Director, Ministry of Water Resources, China, underscored water shortage as a key threat to water basins in China, outlining strict water management as a response measure. He explained policies setting “red line” thresholds on water volume usage, efficiency and pollution levels. Victor Hugo Alcocer Yamanaka, National Water Commission (CONAGUA), Mexico, highlighted Mexico’s vulnerability to extreme weather events, and outlined effective policy measures taken such as a national programme to prevent drought and flooding, and the development of risk atlases. Kabiné Komara, High Commissioner of the Senegal River Basin Development Organization (OMVS), spoke on cooperation initiatives in which the Senegal River is considered common property of all countries it passes through. He detailed plans for a new dam that would produce clean energy, hoping to provide an example for other African countries. Charafat Afilal, Minister of Water, Morocco, presented her country’s experience in water politics, explaining that Morocco has developed an important stock of water for use during drought, and has implemented laws to further empower basin agencies. Christine Gbédji Vyaho, Minister of Water, Benin, underscored dam construction as a policy measure to respond to water shortages and to increase food security. She mentioned measures being undertaken with neighboring countries to build hydroforming structures and underscored the importance of regulatory measures as well as institutional actions. On behalf of India, Ahmad spoke about India’s status as the largest consumer of groundwater, pointing to the impacts of low groundwater levels on river basins. He presented a US$1 billion programme to reform groundwater management in India, as well as large government projects to reduce pollution in river basins. Simon Sakibede, Secretary General, International Commission of Congo-Oubangui-Sangha (CICOS), said resource management is a key concern for the Congo River Basin and detailed solutions being implemented, including the development of a steering programme providing guidelines, objectives and measures for water management. Christian Friis Bach, Executive Secretary and Under-Secretary-General, UN Economic Commission for Europe (UNECE), spoke on the global network of basins working on climate change adaptation, underscoring the importance of acting quickly to form transboundary water cooperation frameworks. He called for better linking of climate change strategies and water management, and building in financial mechanisms from the outset. 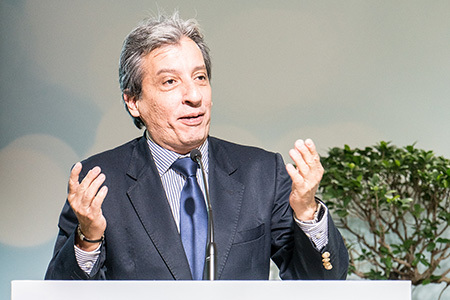 Manuel Pulgar-Vidal, Minister of Environment, Peru, underscored the importance of translating scientific knowledge into clear messages to enable more effective policymaking and governance. 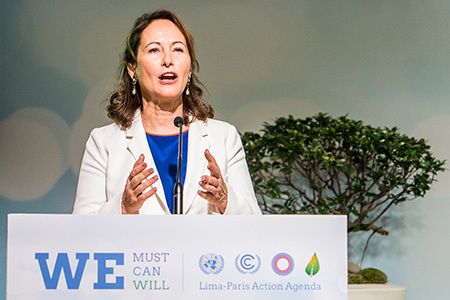 Ségolène Royal, Minister of Ecology, Sustainable Development and Energy, France, announced the ‘Paris Pact on Water and Adaptation to Climate Change in the Basins of Rivers, Lakes, and Aquifers,’ expressing France’s commitment to act on the principles of the Pact with concrete policies. 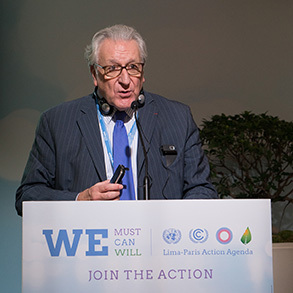 Jean-François Donzier, INBO, reiterated the importance of rapid action to address water-related climate impacts. Charafat Afilal, Minister of Water, Morocco, said that most of Morocco is already experiencing temperature increases of 1ºC. 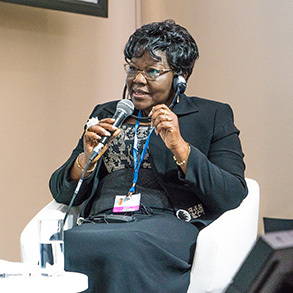 Christine Gbédji Vyaho, Minister of Water, Benin, explained her country was undertaking plans to regenerate damaged land. Panel (L-R): Jean-François Donzier, INBO; Junaid Ahmad, World Bank; Simon Sakibede, Secretary General, CICOS; Christian Friis Bach, Executive Secretary & Under-Secretary-General, UNECE; Kabiné Komara, High Commissioner, OMVS; Charafat Afilal, Minister of Water, Morocco; Victor Hugo Alcocer Yamanaka, National Water Commission (CONAGUA), Mexico; Du Guozhi, Director, Ministry of Water Resources, China; and Christine Gbédji Vyaho, Minister of Water, Benin. This side event, moderated by William Rolleston, World Farmers’ Organisation (WFO) heard from a panel of farmers, science experts and market representatives. Presentations focused on the possibilities and practicalities of improving agricultural productivity while increasing resilience to climate change. Evelyn Nguleka, President, WFO, introduced the session, emphasizing that farmers can be part of the climate change solution, and the key question is how farmers are going to be heard in decision-making and improve their resilience to climate change. Luis Martinez, coffee producer representative, Mexico, talked about the challenges of climate change for agriculture in Latin America. 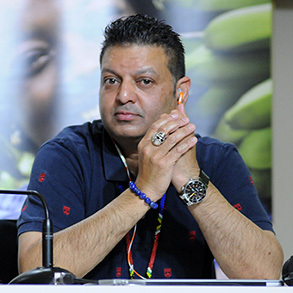 He said farmers’ responses to climate change include requesting support from fairtrade buyers, and diversifying crops by maintaining and protecting local seed systems. Victor Biwot, tea producer, Kenya, talked about his work with small scale tea and livestock farmers in Kenya, including encouraging local farmers to: diversify their crops; plant trees for soil stability; and improve energy efficiency to mitigate emissions. Xavier Beulin, farmer representative, Europe, reiterated that extreme weather events are becoming more consistent, and called for farmers worldwide to invest in making agriculture more resilient to climate change by, inter alia, improving water management and storage. 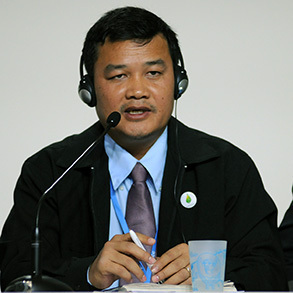 Sok Sotha, representing farmers from Asia and the Pacific, outlined work with local farmers to build networks with consumers, and to provide training for adaptation to changing weather patterns. Rolston posed three questions regarding climate adaptation, resilience and the value of partnerships. On spreading climate risks and costs throughout the production chain, Chris Miller, Ben & Jerry’s, observed that they are already seeing climate change challenges in their supply chain. Zaheer Fakir, GCF Board member, said climate finance mechanisms are not likely to be able to support farmers, and that farmers need to take charge of their own destiny, working in cooperatives to leverage collective action. Martinez opined that more educated, conscious consumers are needed to enable the agricultural costs of climate change to be shared among all stakeholders. On encouraging increased production, reduced waste and improved distribution and access, Mariana Rufino, Centre for International Forestry Research (CIFOR), underscored the importance of decreasing agriculture-related emissions, including methane-producing activities and deforestation. During discussion, participants considered: the potential of an ecosystem service approach to reward farmers; and the potential for mainstreaming agroecology and fairtrade into agriculture commodity chains. Luis Martinez, coffee producer representative, Mexico, said “This is not in the future: we are already suffering from climate change,” including the devastating spread of plant diseases and infestations. 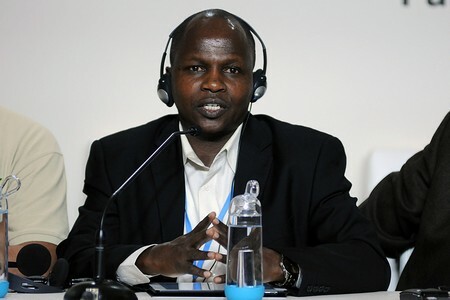 Victor Biwot, tea producer, Kenya, reported increasing weather volatility, including long droughts, floods and severe hail storms, all of which affect agricultural production and livelihoods. Xavier Beulin, farmer representative, Europe, stressed that farmers are key actors for managing and storing carbon in soils, and this needs to be better recognized. Sok Sotha, representing farmers from Asia and the Pacific, underscored that an enormous proportion of the Cambodia’s population involved in farming is currently being affected by increased food scarcity due to extreme weather events, droughts, flooding and new diseases. Zaheer Fakir, GCF Board member, said “we have become so far detached from what is needed on the ground for farmers”, underlining that bureaucracy makes it virtually impossible for farmers to approach climate finance. Panel (L-R): Luis Martinez, coffee producer representative, Mexico, with his interpreter on the left; Victor Biwot, tea producer, Kenya; Xavier Beulin, farmer representative, Europe; Sok Sotha, farmer representative from Asia and Pacific; Mariana Rufino, CIFOR; Chris Miller, Ben & Jerry’s; and Zaheer Fakir, GCF Board. This side event, moderated by Khalid Abuleif, Saudi Arabia, provided an overview of the INDCs submitted by GCC countries in their efforts to address climate change and promote sustainable development. 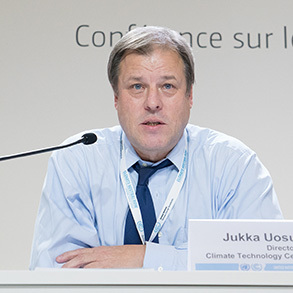 Abuleif underscored that developing the INDCs demanded two years of collective work in the region, as well as interactions with others, especially the EU. He noted that the character of the INDCs is different due to the special characteristics of the region, stressing that most GCC countries already have climate change institutions in place. 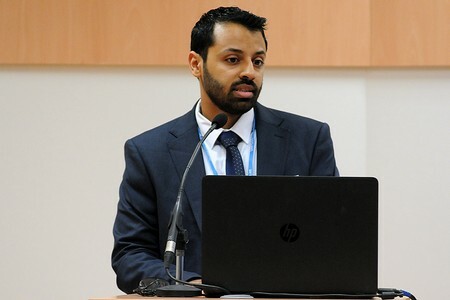 Taha Al Zatari, Saudi Arabia, said his country has a central policy to diversify its economy and reduce dependence on revenues from a single source, including through: investment in renewable energy; carbon capture and utilization/storage (CCS); utilization of gas; methane recovery; and flare minimization. He highlighted adaptation activities with mitigation co-benefits, inter alia: water and wastewater management; urban planning; marine protection; and reduced desertification. Abdulhadi Al Marri, Qatar, stressed natural resources scarcity, and vulnerability, noting oil and gas resources' contribution to economic and social growth. He highlighted economic diversification with mitigation co-benefits, adaptation and response measures, as well as a national Measuring, Reporting and Verification (MRV) system to track progress. 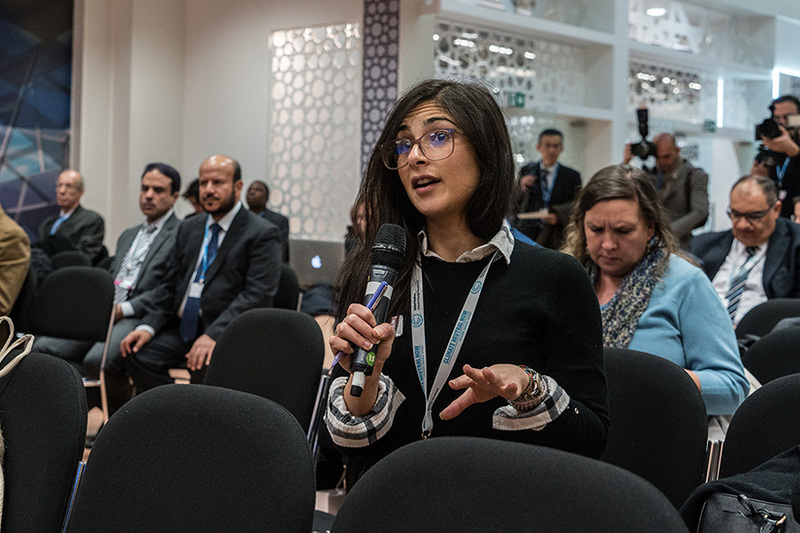 Nora Al Amer, Bahrain, underscored that being a small island, adaptation is a priority for Bahrain, highlighting coastal zones, water resources, human health and biodiversity as the main topics. She further focused on adaptation with mitigation co-benefits, noting, among others: sustainable management of water; sustainable urban planning; and harnessing biodiversity and ecosystem services. Samah Al Shibli, Oman, addressed, inter alia, the type of mitigation contributions in Oman, namely: reducing gas flaring from oil industries; increasing the share of renewable energy and energy efficiency projects; and developing new legislation on climate change which will support the adoption of low carbon and energy efficient technologies. 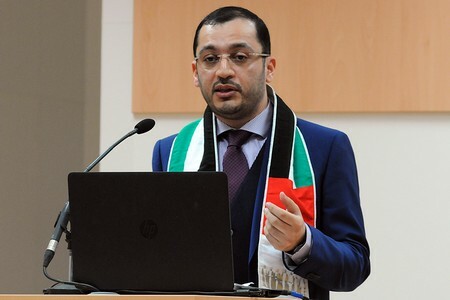 Fahed Al Hammadi, United Arab Emirates (UAE), noted that the country’s INDC includes a clean energy target moving from 0.2% in 2014 to 24% by 2021. Regarding adaptation with mitigation co-benefits, he underscored, among others: water conservation and desalination, as well as wetlands, coastal and marine environmental conservation (blue carbon); improving science and data; and modelling for regional climate impacts and adaptation solutions. 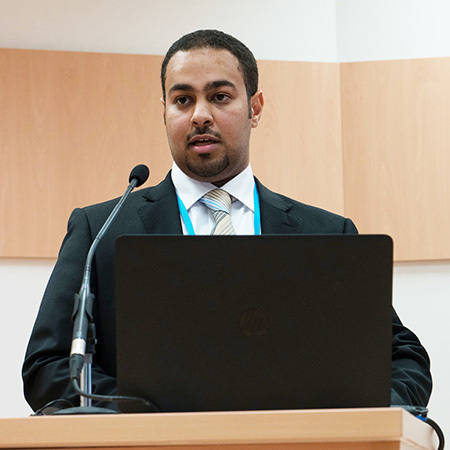 Fahad Al Ajmi, Kuwait, provided an overview of the national circumstances and highlighted adaptation projects to: promote coastal information systems; adapt to dust storms; ensure food security; and adapt to lack of water. Regarding mitigation, he stressed: renewable energy; environmentally friendly fuel; energy from waste; and the transport sector. In the ensuing discussion, participants addressed, inter alia: the development of common GCC country strategies; the potential to develop a GCC blue carbon strategy; timeframes to calculate emission reductions; emissions intensity targets; MRV; and potential use of market mechanisms. Fahad Al Ajmi, Kuwait, emphasized the diversification of Kuwait’s energy resources, which will limit greenhouse gas emissions. Fahed Al Hammadi, UAE, underscored that growing experience with clean energy will lead to faster adoption. Panel (L-R): Khalid Abuleif, Saudi Arabia; Taha Al Zatari, Saudi Arabia; Abdulhadi Al Marri, Qatar; Nora Al Amer, Bahrain; Samah Al Shibli, Oman; Fahed Al Hammadi, UAE; and Fahad Al Ajmi, Kuwait. This event, moderated by Mohammed Al Hajri, Saudi Aramco, showcased GCC regional climate adaptation efforts through: habitat and water conservation, marine protection and urban planning. Abdullah Al Suhaibani, Saudi Aramco, presented on the diverse ecology of the Arabian peninsula, stressing there are 67 different ecological areas in the region, that 15% of species are endemic and that 88% have not been evaluated. He explained major challenges include droughts, overgrazing, urbanization and off-road driving, and showcased conservation efforts in the Abqaiq wetland and the Shaybah dune habitat. 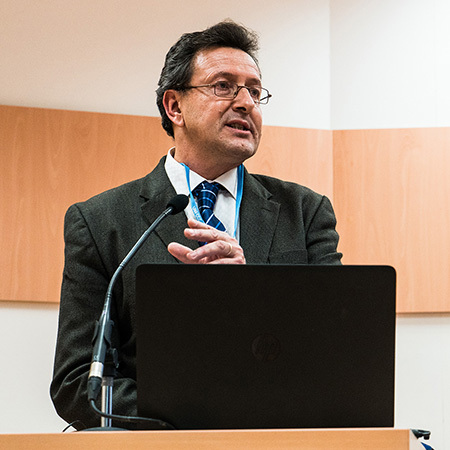 Carlos Duarte, Saudi Arabia King Abdullah University of Science and Technology (Kaust), considered mangroves, seagrasses and salt marshes as three key global carbon sinks that had been overlooked until recently. He explained the term “blue carbon” is being used to help recognize and strengthen the key role of these ecosystems play in carbon sequestration. Zaour Israfilof, SABIC, outlined the chemical company’s development of a risk management matrix, incorporating climate-related risks such as: costs due to low carbon technology requirements; physical assets affected by climate change; changing customer preferences; and national and international climate regulations. Masoud Al-Marri, Director, Agricultural Research Department, Ministry of Environment, Qatar, considered plant genetic resources and climate change. He stressed that adapting crops to future climatic conditions is essential, and reported on the establishment of plant gene banks to improve preservation, knowledge and use of seed varieties for agricultural productivity and food security. Abdelaziz Elmegbl, Arriyadh Development Authority, Saudi Arabia, presented on the King Abdulaziz Public Transport Project, informing participants that it is the largest of its kind in the world. He noted roads currently represent around 37% of land use, with a low public transport rate of around 2%, and outlined plans for a new extensive, city-wide metro and bus system, noting it will be low-sulphur. Al Hajri presented on water management, saying Saudi Arabia is defined as a ‘severe water-scarce’ nation, with water consumption far exceeding renewable resources. He stressed country-wide actions, including: government plans to reduce water consumption; national provision of high-quality treated waste water for irrigation; and coupling renewable water resources with renewable energy. The discussion considered: ways to improve rainfall harvesting; ways to improve renewable energy and biodiversity conservation into water desalination activities; and how the preservation of “blue carbon” could contribute to the region’s mitigation commitments. Abdullah Al Suhaibani, Saudi Aramco, showcased conservation efforts in the Abqaiq wetland and the Shaybah dune habitat. Zaour Israfilof, SABIC, described how the third largest global diversified chemical company, with 40,000 employees, adapts to climate change. Carlos Duarte, KAUST, stated that mangroves, seagrasses and salt marshes are being lost at a rate faster than tropical forests. Abdelaziz Elmegbl, Arriyadh Development Authority, Saudi Arabia, outlined the King Abdulaziz Public Transport Project, which aims to reduce private vehicle journeys by 2.2 million per day in Riyadh. Panel (L-R): Carlos Duarte, KAUST; Mohammed Al Hajri, Saudi Aramco; Abdullah Al Suhaibani, Saudi Aramco; Zaour Israfilof, SABIC; Abdelaziz Elmegbl, Arriyadh Development Authority, Saudi Arabia; and Masoud Al-Marri, Ministry of Environment, Qatar. A participant asks how biodiversity is being preserved in light of intensive water desalination activities in shared water resources across the GCC. This session, moderated by Clifford Polycarp, GCF, considered the characteristics of a good GCF project, presenting examples of lessons learned and future suggestions from countries and institutions. Henrik Harboe, GCF Board Co-chair, outlined the work of the GCF over the past year, noting that the funding achieved so far is a good start, but that further scaling-up needs to be done to make it “truly transformational.” He expressed the need for further elaboration on specific investment criteria for projects, and looked forward to lessons to be learned from the first round of project approvals. Alberto Paniagua, CEO, Profonanpe, spoke on key issues for GCF accreditation and project development. On accreditation, he underscored the importance of: experience in administering financial resources; evidence of skills in monitoring and evaluating projects; and a strong background in accountability. 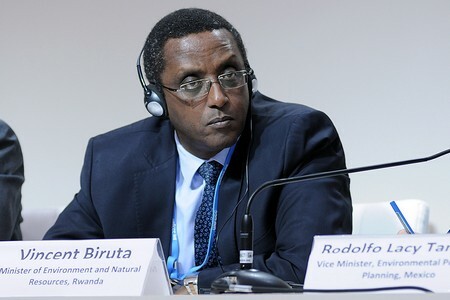 Vincent Biruta, Minister of Environment and Natural Resources, Rwanda, pointed to the importance of country ownership of projects, suggesting the GCF should work directly with nations and the institutions responsible for serving citizens. He underscored the need to foster partnerships and promote approaches that integrate energy, poverty reduction, environmental protection and climate change resilience. Rodolfo Lacy Tamayo, Vice Minister of Environmental Policy and Planning, Mexico, said innovative ideas to engage the private sector in low-carbon investments are key to a good project, citing the example of green bonds to encourage efficiency in small- and medium- size enterprises. 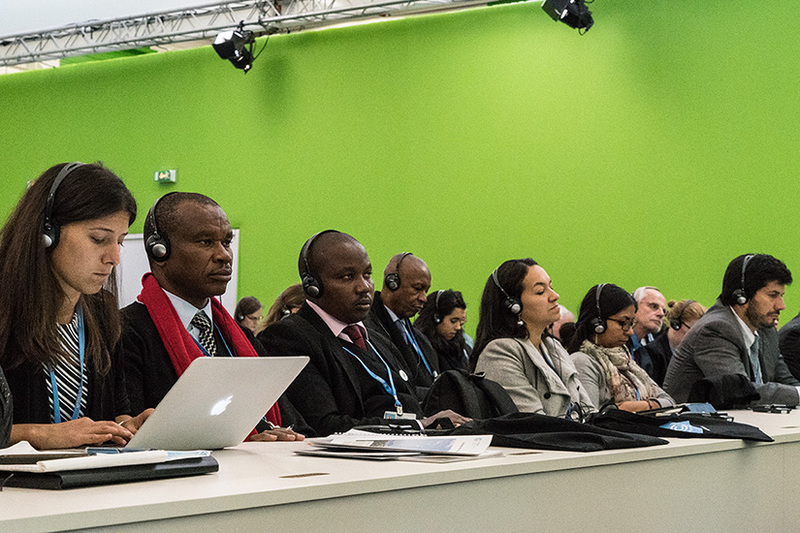 He encouraged parties to foster growth of the GCF to further mobilise climate finance, and stated it as “highly important” for the GCF to be a substantive part of a new agreement. Ato Kare Chamwicha, Minister of Environment and Forests, Ethiopia, spoke on Ethiopia’s commitment to build a green economy and achieve net-zero emissions by 2050. 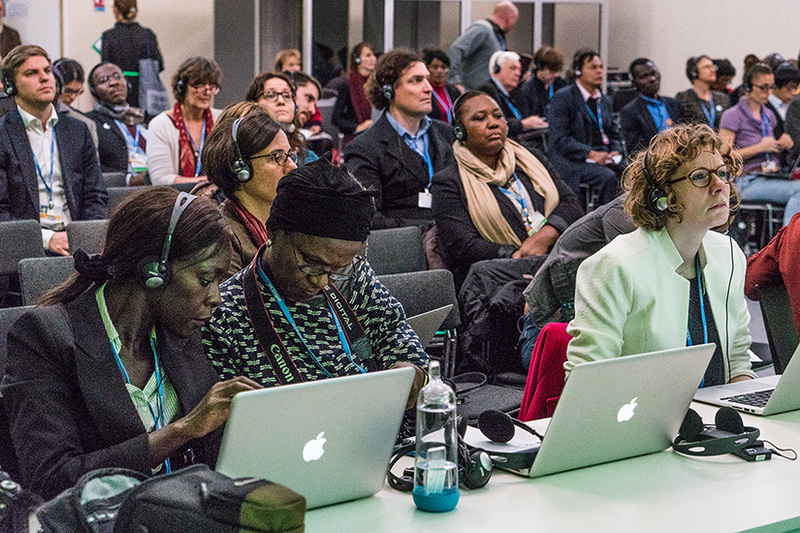 He asserted the importance of fair access to GCF projects, suggesting that the Fund should not focus on mitigation potential of projects alone, stating this would unfairly limit funding opportunities for countries with low emissions and low incomes. 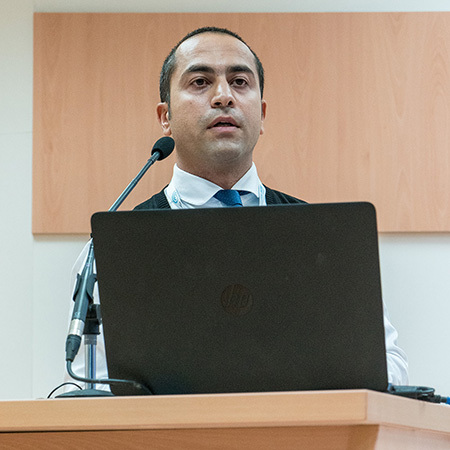 Amjad Abdulla, Maldives, highlighted a strong institutional framework to coordinate coherence between programmes as an important part of a good project. He expressed satisfaction that the Maldives was one of the first two projects accepted, and hoped for the development of a simplified, expedited process for the most vulnerable small islands going forward. 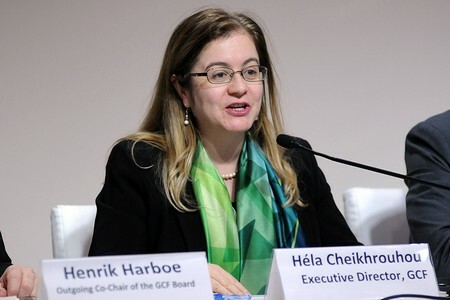 Héla Cheikhrouhou, Executive Director, GCF, highlighted six key selection criteria of a good project: tangible climate mitigation or adaptation impacts; promotion of climate-resilient development pathways; generation of other sustainable development benefits; demonstration that the aims of the project are of key importance to the bidding country; sound reasoning for the choice of GCF funding, rather than other sources of financing; and sustainable efficiency of the project over time. 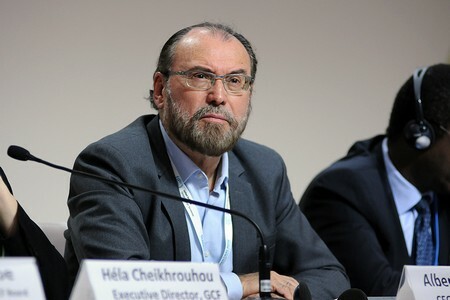 Héla Cheikhrouhou, Executive Director, GCF, expressed the need to ensure that limited funding is targeted for the greatest impact. 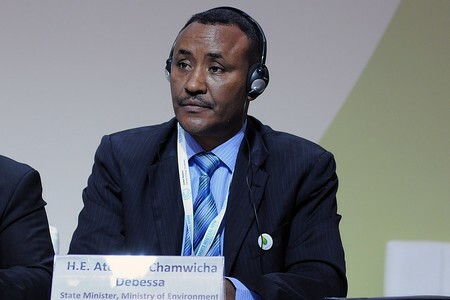 Ato Kare Chamwicha, Minister of Environment and Forests, Ethiopia, said the GCF Secretariat could help countries develop good projects by ensuring clear and concise communication to avoid wasting bidding countries’ scarce resources. Vincent Biruta, Minister of Environment and Natural Resources, Rwanda, pointed to the importance of requiring returns on investments in order to maintain sustainable funding processes and not rely solely on grants. Alberto Paniagua, CEO, Profonanpe, suggested that a good project should work with vulnerable communities and ecosystems, and balance the conservation of national resources with mitigation and adaptation measures. Panel (L-R): Clifford Polycarp, GCF; Henrik Harboe, GCF Board Co-chair, Héla Cheikhrouhou, Executive Director, GCF; Albert Paniagua, CEO, Profonanpe; Vincent Biruta, Minister of Environment and Natural Resources, Rwanda; Rodolfo Lacy Tamayo, Vice Minister of Environmental Policy and Planning, Mexico; Amjad Abdulla, Maldives; and Ato Kare Chamwicha, Minister of Environment and Forests, Ethiopia. 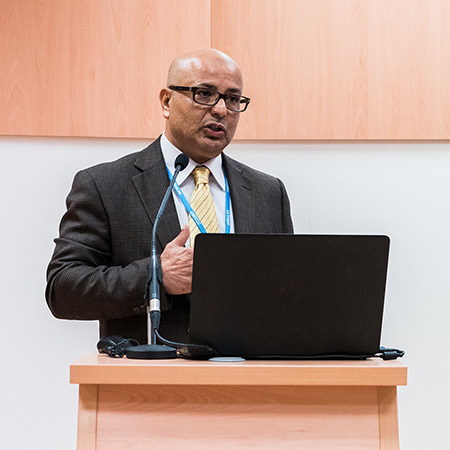 This side event, moderated by Ravi Prabhu, ICRAF, addressed: nutrition and food security, energy and integrated landscape management in the context of climate change, positioning the discussion in the Sustainable Development Goals’ (SDGs) framework. 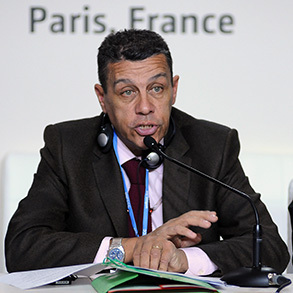 Andre Leu, President, IFOAM, stressed that stopping emissions will not be enough to address climate change, drawing a dark picture of what the 2°C scenario will entail for the livelihoods of millions of people. He highlighted, among others, that soils are the greatest carbon sink after the oceans and that regenerative agriculture can strip CO2 out of the atmosphere and deposit it in the soil. Underscoring the importance of joint efforts between ICRAF and IFOAM, Meine van Noordwijk, ICRAF, said that while agriculture and forestry are separated in the world of policy, recent data shows that 42% of the agricultural land has at least 10% tree cover. He noted that while adaptation and mitigation follow different paths under current policy developments, the challenge is to recombine them. 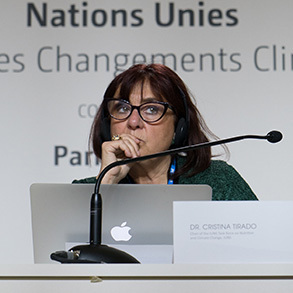 Cristina Tirado, International Union of Nutritional Sciences (IUNS), provided an overview of the impacts of climate change on nutrition, opening the discussion on how agroecology and agroforestry can help to improve nutrition. She presented future projections concerning water scarcity, hunger and caloric availability, and addressed micronutrient deficiencies. Focusing on nutrition sensitive climate adaptation projects, she highlighted integrated family farming, mangrove repopulation, extension services and education, and called for nutrition-sensitive mitigation actions that increase diet diversity, while reducing GHG. Alexander Meybeck, FAO, focused on the ongoing dialogue on agroecology under the auspices of FAO. He underscored, inter alia: the importance of gathering and sharing evidence and best practices; the territorial approach to food security and nutrition; the need for more research on agroecology approaches; the necessity to mainstream agroecology in education training and to transmit traditional knowledge; and the importance of policies, producers - especially women, legal frameworks and South-South cooperation. 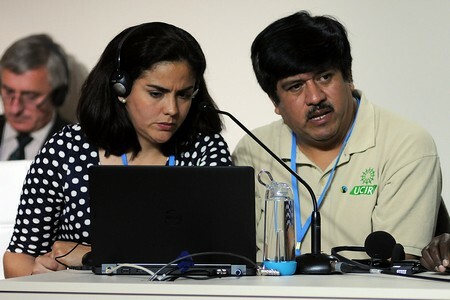 Peter Minang, ICRAF, addressed adaptation and mitigation activities, noting their interconnectedness and underscoring that some countries, like Bolivia, have joint adaptation and mitigation actions. He stressed the need to move towards a synergistic nexus approach, highlighting multifunctional landscapes perspectives. Hans Herren, President, Biovision, addressed the global policy background on inclusive sustainable agriculture and urged action, pointing to the existence of adequate research and evidence. He highlighted, inter alia, the Committee on Food Security and its potential role as a platform to bring science into policy debates; and the SDGs noting they are strongly interrelated, rendering the system circular rather than linear. During discussions, participants addressed, among others: involvement of young people in the agricultural sector; obstacles to change; CO2 as an ally for the farmers rather than an enemy; negative aspects of climate-smart agriculture; and involvement of farmers in the climate negotiations. Andre Leu, President, IFOAM, noted that organic agriculture, among others, uses water more efficiently and produces higher yields in climate extremes. Peter Minang, ICRAF, stressed the need to move from complementarities to synergies. Cristina Tirado, IUNS, pointed out that severe stunting is estimated to increase by 23% in central Sub-Saharan Africa and up to 62% in South Asia by 2050, due to climate change. 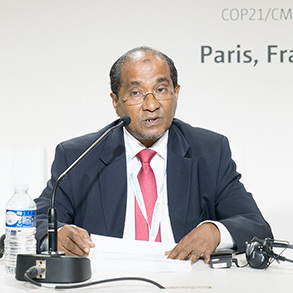 This side-event was introduced by Abdullahi Majeed, Minister of State for Environment and Energy, Maldives. Thoris Ibrahim, Minister of Environment and Energy, Maldives, presented the Climate Resilient Safer Islands Programme for Small Island Developing States (SIDS). 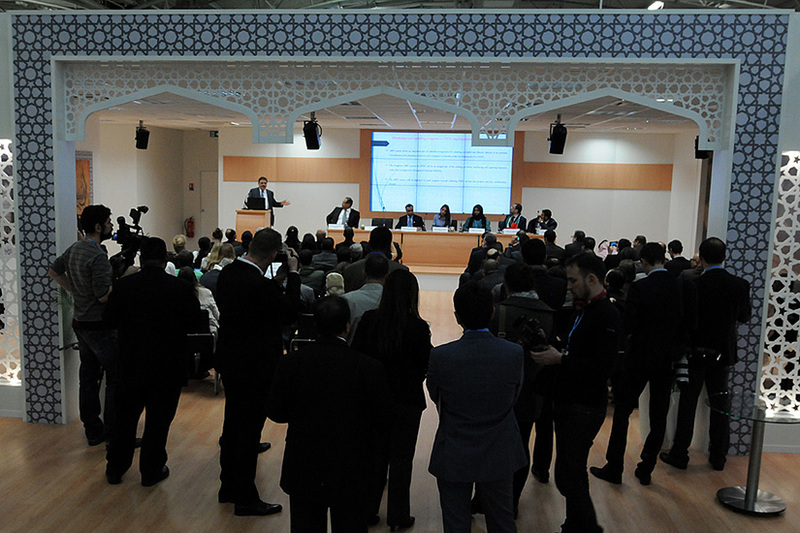 He explained that the programme aims to achieve economic, social, ecological and infrastructure resilience. He presented case studies from: Vilifushi, where the entire population was relocated while the island was reconstructed; Thinadhoo, where the island was reconstructed while inhabited; and a virgin island, which was prepared for habitation. He concluded that the characteristics of safe islands are: accessibility; safeguard of critical infrastructure; economic diversification; and physical infrastructure such as coastal protection, buffer zones and elevate ground levels. 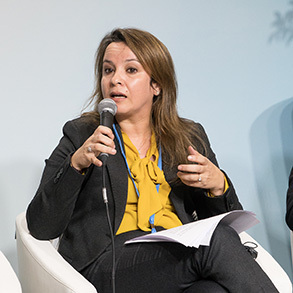 Carole Dieschbourg, Minister for the Environment, Luxembourg, underscored, inter alia, Luxembourg’s contribution to the Global Facility for Disaster Reduction and Recovery; and the Climate Risk Early Warning Systems, launched at COP21. 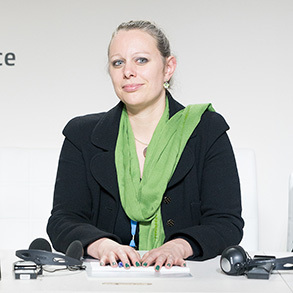 She stressed the need to join forces to achieve an ambitious legally binding agreement to keep us far below 2ºC, and to ensure the inclusion of the issue of loss and damage. James Fletcher, Minister with responsibility for Public Service, Information, Broadcasting, Sustainable Development, Energy, Science and Technology, St Lucia, highlighted similarities amongst predicted impacts of climate change on SIDS. He remarked how SIDS’ infrastructure needs to be made climate resilient; that repair and recovery are draining financial resources; and that SIDS are taking responsibility to convert their energy systems, but do require support. He highlighted the need to share experience amongst SIDS and to create early warning facilities, as well as the need for public education. 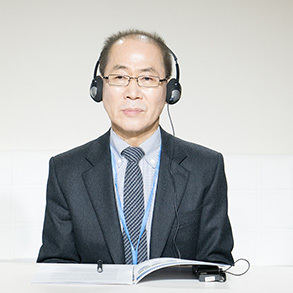 Hoesung Lee, Chair, Intergovernmental Panel on Climate Change (IPCC), highlighted the need for improved participation of developing countries experts, especially SIDS, in the Panel’s work. Noting that the goal of the 6th assessment report is to make the IPCC’s work more relevant to policy-makers, he emphasized that contribution of developing countries and SIDS would be especially welcome to better understand policy needs, as well as best practices. In the discussion, participants addressed: early warning systems; the role of science in increasing resilience in SIDS; gender-sensitive adaptation; and renewable energy generation in SIDS. Abdullahi Majeed, Minister of State for Environment and Energy, Maldives, cautioned that success at COP21 might be the last chance for SIDS. Hoesung Lee, IPCC, called for greater participation from developing countries experts to the work of the IPCC, especially from SIDS. Carole Dieschbourg, Minister for the Environment, Luxembourg, emphasized collaboration between Luxembourg and SIDS. Panel (L-R): Abdullahi Majeed, Minister of State for Environment and Energy, Maldives; Thoriq Ibrahim, Minister, Environment and Energy, Maldives; Carole Dieschbourg, Minister, Environment, Luxembourg; Hoesung Lee, Chair, IPCC; and James Fletcher, Minister responsible for for Public Service, Information, Broadcasting, Sustainable Development, Energy, Science and Technology, St Lucia.